Here’s a little secret though, about this turkey-est of holidays: you don’t have to roast a whole turkey on Thanksgiving. It’s true. It’s not even sacrilege. Not when you make a turkey roulade, instead! A roulade hits all the high points of the holiday – tender meat, crispy skin, warm stuffing – without any of the lows (like waiting 3 hours for a whole bird to roast, for one). It’ll still feed and please a crowd, but can also be scaled down for a smaller, more intimate gathering. Plus the recipe is from my cookbook (the whole thing cooks on one sheet pan, yipee! ), which comes out in just 9 days! Celebrations all around! With this gorgeous roulade on the table, all you’ll really need to round out a hearty Thanksgiving dinner is some mashed potatoes, gravy and cranberry sauce! And maybe a few slices of pumpkin or pecan pie. Or both. …Probably both. I know this is a busy week, but check back in periodically — I’ll have a few more recipes up for you before Thanksgiving, and maybe even a giveaway or two! Happy turkey week! It’s definitely possible to debone your own turkey breast, but it’s a pretty time-consuming effort so, if you can, have your butcher do the dirty work and buy a boneless breast with the skin still on. Preheat the oven to 400 degrees F with a rack in the center position. Line a sheet pan with aluminum foil. Toss together the squash, leek, potatoes, 1/4 cup olive oil, 1/2 teaspoon salt, and 1/2 teaspoon pepper in a large bowl. Arrange the hash in a single layer on the sheet pan and set it aside. Transfer the bread cubes to the (unwashed) large bowl, add the scallions, cranberries, apple, sage, thyme, stock, milk, egg yolk, garlic powder, 2 tablespoons olive oil, 1/2 teaspoon salt, and 1/2 teaspoon pepper, and stir to combine. Set the stuffing aside. Set the turkey breast skin side down on a cutting board and lay a big piece of plastic wrap on top of the meat. Use a heavy pan or flat-sided meat tenderizer to pound the turkey breast to an even thickness, about 1 inch. Remove the plastic and spread the stuffing evenly over the meat, leaving a 1/2-inch border on all sides. Starting with one of the long sides, roll up the turkey breast, fairly tightly, like a jelly roll. Use some butcher’s twine to tie up the roulade at 1-inch intervals. Place the turkey roulade, seam side down, on top of the hash on the sheet pan. Sprinkle the roulade with 1/4 teaspoon salt and 1/4 teaspoon pepper, and rub a bit of extra olive oil over the skin. Roast until an instant-read thermometer inserted into the thickest part of the roulade registers 165 degrees F, about 1 to 1 1/2 hours. Allow the roulade to rest for 15 minutes before cutting it into 1-inch-thick slices. Serve with the autumn hash. I ate that roulade and it was delicious. Happy Thanksgiving, y’all! Happy Holidays! Love your book, bought copies for gifts this Xmas. When we roast a turkey we generally brine it first which makes it much more foolproof to not having dry turkey. 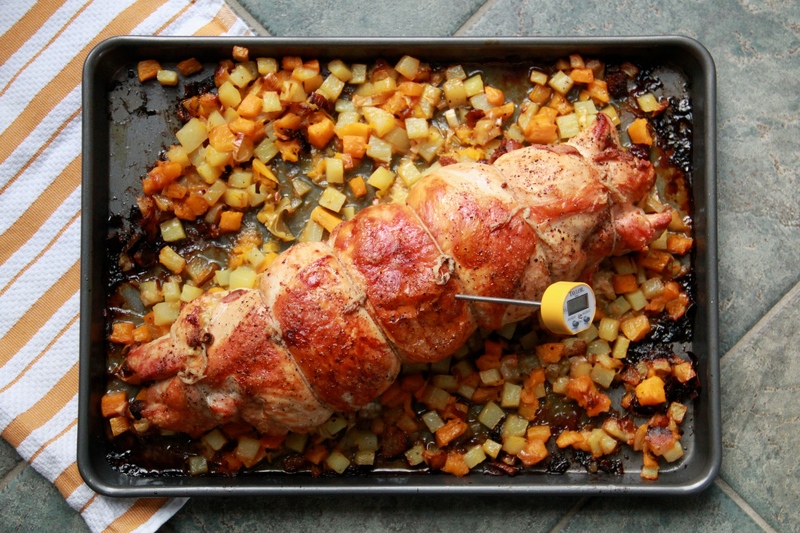 Would you consider brining the turkey breast before making the roulade? Thanks! Hi db! I’ve never brined the breast before I roast it, but it sounds like a great idea! If you try it, let me know how it goes!